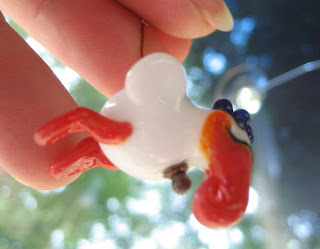 Along with the glass lampwork beads that Liz sent me, she included this really large tear drop bead. I don't know what it is. 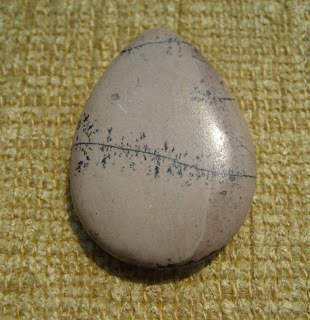 It looks to me like it could be rhodonite. I would call it that, but the flipside is so different from the front, that I really don't know what it is at all (both are equally as beautiful). 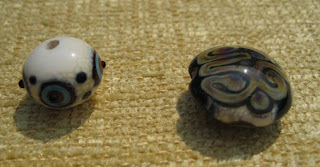 This is easily the largest bead that I have, measuring 1" across and 1 1/2" top to bottom and approximately 1/8" thick. Here is the front (or what I call the front). Here is the back (or what I call the back). 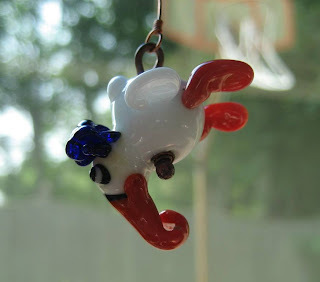 My great friend Liz from Ontario made me this super sweet bead. 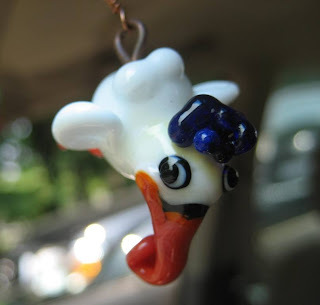 I hung it from my rearview mirror, so I can watch it fly while I am driving. He has a ton of personality. His face is lopsided and he hangs funny. Liz also sent me these beads that she made. I love them all! These are my two favorites. This is not finished, as it needs a clasp. 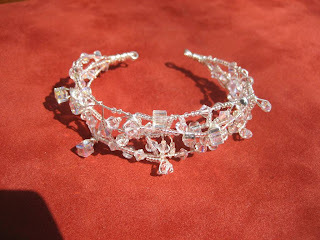 I am making this for a friend of Julie's who might like to purchase 4 of these for her bridesmaids. 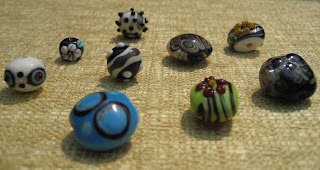 I am not sure what kind of clasp I will use, whether I will make one, or use one that I purchased. 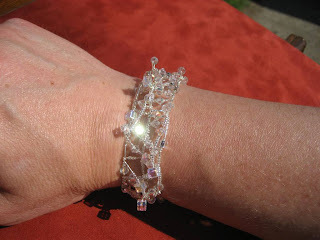 I am hoping to make another crazy bracelet like this by crocheting it. I think it will take a lot less time, and I can charge less. This bracelet took me approximately 5 hours total already, I had to make it up as I went along, trying to copy a bracelet that Julie had, but making it more delicate. The materials are sterling silver wire in 22ga for the structure and 24ga for the wraps, the beads are swarovski crystals in clear and AB, clear and silver lined #15 seed beads, and some silver lined triange beads. I started this necklace on my vacation, although all I got done was stringing the beads until I had a 2 1/2 hour layover in Ohio...that prompted me to actually make it. 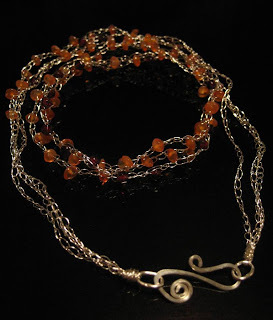 Crocheted sterling silver wire with carnelian and garnet beads. 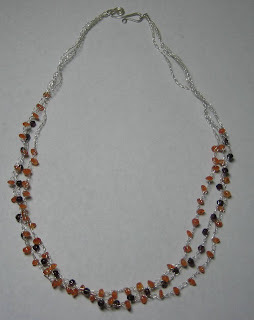 I love this type of necklace, I have made many of these in various gemstones. 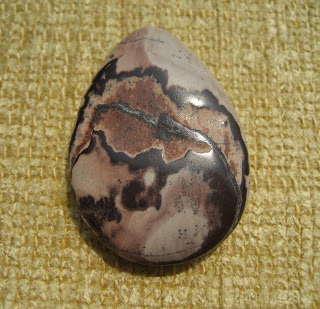 This one is particularly delicate, it can be wrapped around a smallish wrist three times for a nice bracelet, too.